This delicately flavored low-calorie dessert is an absolute delight to eat! 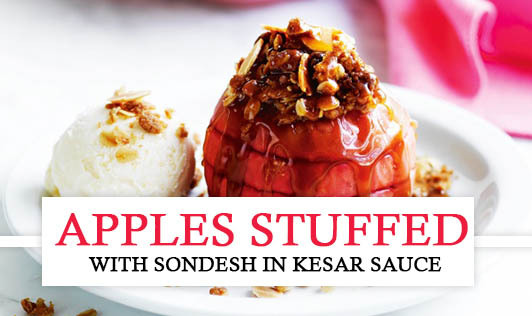 • Cut the apples into halves, scrape out their centers and set aside. • Add 2 cups of water, sugar, lemon juice, and apples into a nonstick sauce pan and cook on low flame, until they turn slightly soft. • Remove the apples from the sugar syrup and keep aside. • Boil the remaining syrup until it turns thick and keep aside. • Blend the paneer, low fat milk, and sugar in a mixer together until smooth and creamy. Divide the mixture into 4 equal parts. • Now stuff the apples with the stuffing. • Arrange them on a plate. • Drizzle the sauce on them and refrigerate. • Garnish with almonds slices and serve chilled.